Florentine fine gold and leather goods. La Galleria Michelangelo offers a wide assortment of traditional Florentine leather products, together with a series of courses that focus on various techniques of leather treatment, and the working of leather objects, including craft boxes, books, and precious bags. Our collection also features unique items manufactured on-site, tailor-made by the expert hands of our craftsmen according to the most ancient traditions of Florentine leather. 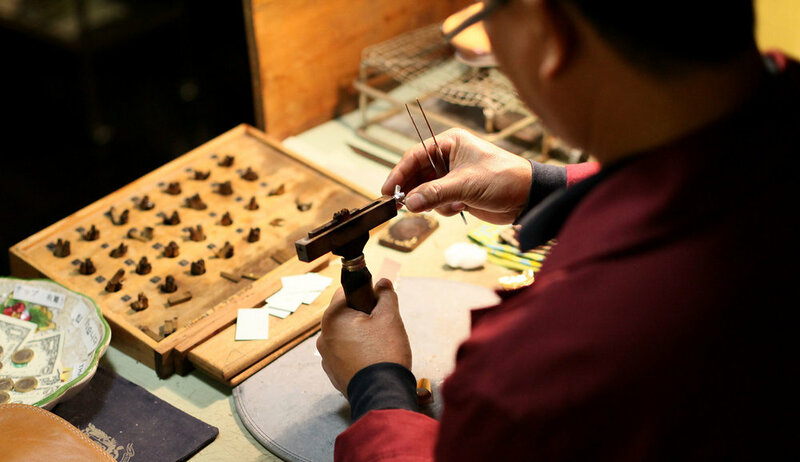 Raffaele is specialized in creating tailor-made leather bags, purses, jewelry boxes and other precious handcrafted objects. He holds regular workshops on the art of Florentine leather and paper. Raffaele is also a specialist in antique books restoration and conservation. He has created a series of instructional videos on YouTube that illustrate several techniques on book binding and paper restoration. Watch Raffaele in action here.